Having been here for 18 years, how has G&B and your role changed over the years? I joined in 1999 as a Marketing Manager and starting with the structure, the buildings have all changed; where we’re sat now in 2009 was a ceiling void. There was nothing here at all. Reception looked a lot different to how you see it now as there was no staircase and certainly no horse. So, all of this wasn’t here, and I was part of building all of this; the auditorium, the gallery none of this was here. The Showroom was where we did lots of different things and it just went right up to the ceiling so you could see spotlights and sky. The design studio didn’t look like it does now either, so that’s how physically the building has changed. My first role was within the marketing department, which is a very similar size to what it is now, looking after one of our key accounts; B&Q. I was also getting more involved in the PR & advertising side of things too. We then brought in somebody else and I took a step back from the key accounts and started to look at the International side of the business. I also helped to build our first transactional website which enabled our customers to come to us directly for our product when they couldn’t find it in store. I’ve done many ‘pitches’ to various businesses around the world too. Launching the ‘Wallpaper is Back’ project to convince people that wallpaper is still trendy. Which of course it is again. That’s where PR really started to take off for G&B. One of the first being Frames wallpaper which got massive press coverage. We started to look at more designers, with Laurence Llewelyn Bowen being so successful. I was intrinsic in getting Wayne Hemingway signed up, whilst our Dutch team took the lead in bringing on Marcel Wanders, which I’ve always appreciated as I have loved working with him. I led a project with the directors to bring category management in to the business. That was when we really got in to shopping psychology – how do people behave in store; how do they react and think to our product? Which is not too dissimilar to where we are with Ecommerce. How are people shopping online? But the principle is still the same, it’s all about behaviour. I learnt a lot in that and it was a big step change for G&B as a business. I know how this company works inside out and I’ve grown through the systems and new product areas. You get a lot of experience. I can’t remember when exactly I became Head of Brand. Graham & Brown wasn’t even a brand when I joined, it was just a name of the company. I always remember pitching the new branding to Roger Graham & David Brown (2nd generation joint Managing Directors), with our only other branded item being Superfresco. 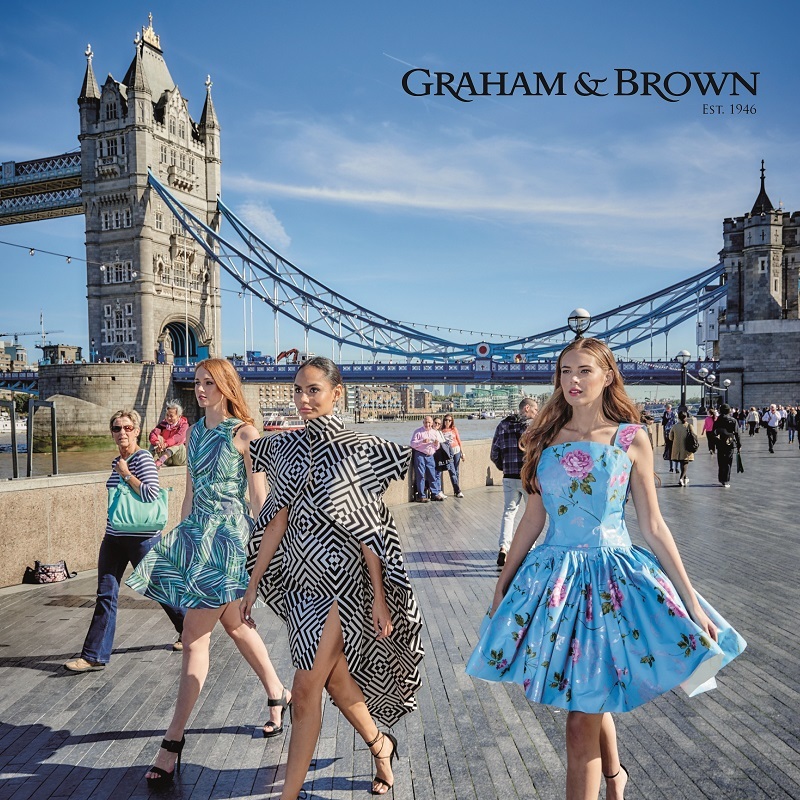 So I sat in the boardroom with them both, showing them this Graham & Brown label and mentioned how it was like Dolce & Gabana, an instantly recognisable household brand, and they loved it. They could see that there was an opportunity and I guess over the last 10 years our marketing effort has really gone in to positioning Graham & Brown as a Coolbrand, as an innovative brand with a bit of a sense of humour about it. Which is basically just the attributes of the people who work here, that’s what we do. And then turning it into a brand which is the next challenge really, taking the concept of what the Graham & Brown brand is and what our dream of it is to be. So being Head of Brand was about making a statement to the business. Within the last 18 months my role has changed to focus more on building on the wallpaper we sell and with the team adding to them, to a create a full room solution. Before G&B, how did your previous jobs give you the experience you needed to get to be Head of Brand Marketing? So If I rewind all the way back; For me personally when I was at school I was both numerate and creative, but I wanted to go more down the design side so Art was a subject I really enjoyed. I was better at art history than the actual drawing side of it but if we had had computers as powerful as they are today, with all of the video technology I’d have been made because my drawing skills aren’t brilliant but I can visualise things in a creative way. I have two brothers, one in advertising and one in a design agency and being the youngest of three I decided that I didn’t want to go down that route in a typical sibling manor. So I thought, it’s the 80’s, I want to do something in business and I did Business studies because my aim as a young man at the time was to just be a millionaire basically. So I was going to study to be a millionaire. Completely naïvely. I did business studies for 4 years with a placement and decided that the retail side of it wasn’t really for me. I came out of university with a degree and just started about getting a job. I started at Dorma, in Manchester, who at the time were the biggest bed linen brand in the UK. I did 3 months as a print buyer and was then promoted to their instore and exhibitions controller. Which basically meant I travelled around the country designing the retail outlets and merchandising plans for about 30 shops per year. I also worked on their exhibitions. From there I went to work for a company called Prestige, who sold homeware who were again one of the leading brands with manufacturing based in Burnley. Then on to Vymura, who were the biggest wallpaper manufacturer at the time. So I’ve worked with manufacturers my entire career. The sad thing is that of the 4 that I’ve worked with, G&B are the only one with manufacturing facilities still. And I’m really proud that we’re still making things. Manufacturing has become so undervalued in the UK. I’ve gained a lot of experience here. What influences you when creating a collection? Well it could be a myriad of things, it’s definitely more of a collaborative effort than what influences me individually. Obviously, our design and colour trends help to spark an idea. 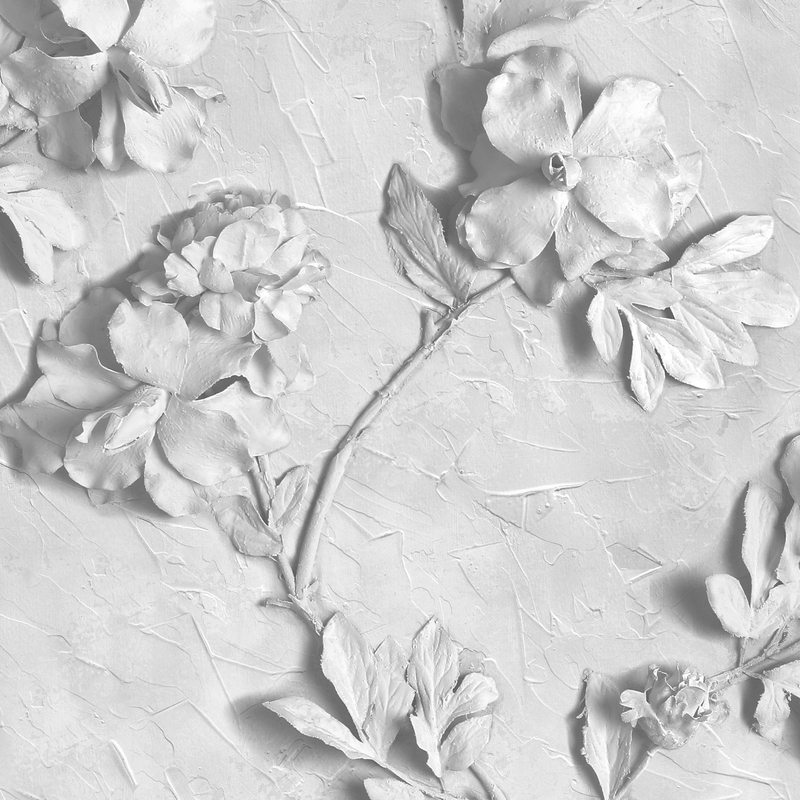 Sometimes it’s just a beautiful piece of artwork that looks fascinating, so if you took the Stone Rose design as an example we had a sculpture on a mood board as a reference piece which Vicky (one of the Studio Designers) then recreated using a real plant, sticking it down, spray painting it white and we photographed it. But we had the view of what it was going to be at the end from just a sourced piece of inspiration. You become quite a “sad” character once you’ve worked in wallpaper for a long time, because you’re constantly looking at your surroundings; at textures and inspirations from other markets of design. You find that most people that work in those areas are snapping photographs, tearing images out of magazines and sometimes you see something that’s been painted and you think ‘that would make a great wallpaper’. Sometimes it’s just watching someone draw, which is our Studio’s main role in terms of what we do. Then you’ve got your collaborations and that takes you down a whole other route really. Working with all manner of designers is quite inspirational. Julian Macdonald is very direct with what he thinks is right for wallpaper so it’s not about couture. Kelly Hoppen is very precise in what she wants and we’ve worked with people like 2LG, who are relatively new & upcoming, that just come and live in the studio pretty much, working with our archive to patch things together in a way that we probably wouldn’t do, being braver. Then you have the left field designers like Brian Eno, being someone I’ve admired for being innovative in music but also has a history in art and installations. It’s people from outside that spark that interest, whether that’s putting a pattern on the ceiling, diagonal lines or things that you don’t normally do. You need designers to come in and break that cycle. Because at the end of the day if you walk through our studio it is like being in an artist’s gallery; you’ve got people painting, drawing and creating. It is art on a roll and that element gets undersold because the last thing you think when you look at the finished product is that someone has sat there and painted it or manipulated a design so that it looks beautiful when it’s on the wall. There’s so much that goes in to our wallpaper and it’s hard to get that across. So that’s what we try to do, we try to tell the stories of how the designs came about and the skill and craftsmenship that goes into everyone. Frames is a great example of left field thinking, which is probably 10 years old now, we were working with 2 artists on a gallery project which was all about interactive wallpaper and art. I always remember them pitching to us. They were talking about how they’d made hats out of bread to see whether the birds would come down and start picking at the bread. It’s that type of art that makes you smile but we were thinking, right what are these guys going to do with wallpaper? They actually came up with quite a simple, interactive idea of simple frames where you fill them on the wall with your things and it went on to be one of our most popular designs. On a similar note, many years ago we had Kate Larson with a Pin the tail on the Donkey idea. Which was a pink donkey made out of butterflies. It was quite an interesting sell to Andrew Graham and we still laugh about it now but again it proved to be quite successful and I think if we brought that back now it would sell equally well. 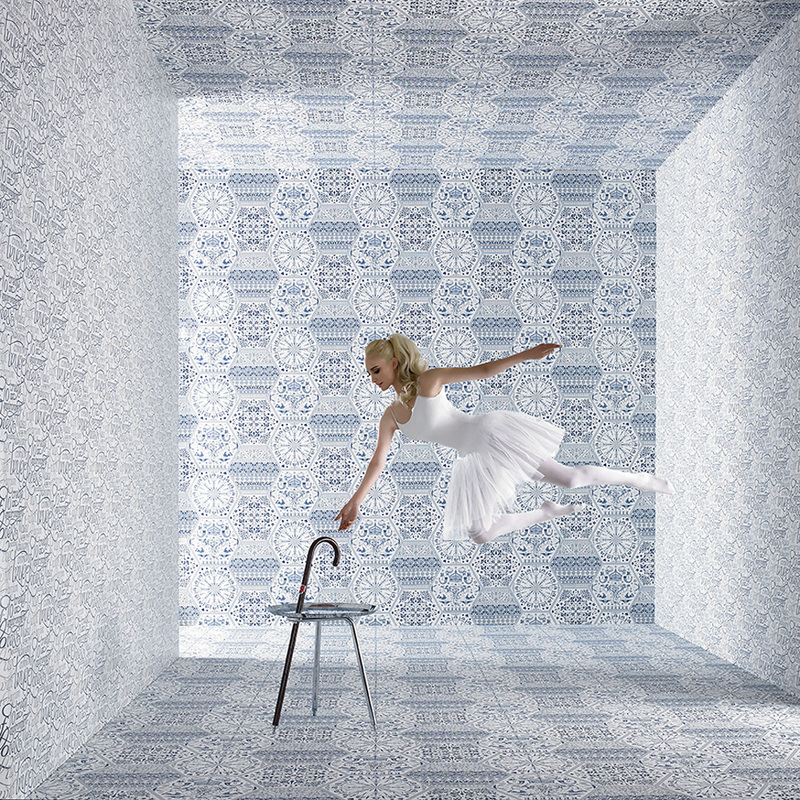 I think for us it’s a real balance because we want people to talk about wallpaper and we want to be stretching the boundaries otherwise we end up being quite a narrow manufacturer, because if you don’t it can quickly become quite old and the creativity can get stuck. G&B have been a Coolbrand for 6 years now, how do you ensure that we maintain that status year on year? It’s not necessarily something we chase after but it goes back to all of these different things we do, like pushing designs to the limit and working with designers, artists, musicians. As well as how we style the way we present our brand; for example, Doris, the Morris Minor wrapped in floral wallpaper, the way our presentations look, the way websites are making it easier to shop, the delivery of the item coming in a sleek branded box with a wallpaper print in it. It’s the sum of all of those parts and activities. Making ourselves unique in our industry as to how we present the brand, ensuring that we remain quite edgy in all aspects around the world. Constantly reinventing ourselves and maintaining our creativity. You manage multiple teams under the Marketing umbrella, how do you spot talent to bring in to the company? The one thing I have learnt over the years, in particular recently, is to not underestimate what people can do. I would recruit on enthusiasm and passion as much as academic ability for sure, because you want people to fit culturally with the organisation but to also be driven, positive, to get things done, have a proactive attitude and people who are fairly fearless; not being over awed by doing something for the first time. Certainly, over the last 3 years we’ve given people responsibility and big projects really quickly and early on. You come in as a Marketing Assistant and give them a project and it’s up to them to rise to the occasion. As a management team, we’re all very supportive and know how things work within the company. It’s all about trust and giving people space to make mistakes. Raw talent is something we look for, somebody who just wants that opportunity to work in marketing and learn. Most people surprise themselves, they surprise me every day and when they’ve done a great job it’s because they’ve taken it on fully. We need that next generation coming through all the time to keep the business going for the next 70 years! What has been your favourite collection/wallpaper you have worked on? That’s a big question. I’ve worked on a lot. I think it probably varies from day to day. I really enjoyed the very first Marcel Wanders collection, working with the team there because they are at the luxury end of the market. The attention to detail and quality paired with the absolute passion about it to be perfect. That’s something I took away from that experience, we want to be perfect too. It was called the Couture collection, with a stunning pattern book that included innovative photography which was absolutely amazing. We literally built 2 cube rooms in a derelict school in Amsterdam. We had ballet dancers come in to model and basically inverted everything so that the room was actually built upside down; all of the furniture was screwed to the ceiling and then the model does her pose on what would be the ceiling and then you reverse the image so that it looks like she’s upside down. We could have done that in photoshop but what I really loved about it was the fact that we didn’t, we did it for real, with furniture coming out of the side of a wall. It was just a great creative project and very well executed for a brand-new product that we had. So, there was a lot of pressure to get it through and we made a video of that journey to create the collection. I think that was definitely up there with my favourite. If you ask me tomorrow I’ll probably say something else, there’s been so much I’ve enjoyed working on. But wallpaper surprises me all the time. I think the thing with that is measuring personal taste, experience, trends and sale data. Trying to pull all 4 of those levers. Sometimes you can be quite concrete with what will and won’t work. I’ve seen designs with feathers and swirls that really look like they don’t work on a wall that have gone on to be best sellers, but you have it the other way too where you think you have a beautiful design with lots of delicate textures and styles but when you pull them together you think it’s amazing but it doesn’t sell. We work with a lot of designers, both within interior design and fashion, how do you select these designers to work with G&B? The first designer we signed was Laurence Llewelyn-Bowen and everybody was after him to work with and that was really about his personality and the popularity of the BBC’s Changing Rooms at the time. You’ve got him leading the way, but every episode they were painting so it wasn’t great for the wallpaper industry and yet you have a designer like Laurence who is a trained fine artist, so that was the rational for that. He was probably the biggest thing to happen for wallpaper in a long time, and now he’s doing it all over again in Australia! There’s a rational for each one. For Wayne Hemingway I’d seen an ad for his Red or Dead brand and it was something like ‘Get pasted’ with shoes on a wallpaper background and I thought that sounded both funny and cool. So we approached him and with him having strong roots in Blackburn we all hit if off quickly. Our relationship was built on trust and he has become a great friend to the business. Then we started looking further afield, working more internationally, so the Dutch team found Marcel Wanders which worked really well there. China found Steve Leung. We worked with Amy Butler in the US, who is a great designer, very much ahead of the times. Our aim was to build people in territories we operated in to create our brand profile in those markets. Then we signed Barbara Hulanicki, Donna Riley’s idea, who has been inspirational and a lot of people in the business were excited to work with her; being quite influential in fashion. I always remember Laurence and Wayne meeting Barbara at our stand at 100% Design and they were awe struck on meeting one of their design heroes. It was great to see that level of respect and admiration. There’s a million reasons why we work with designers. But that’s the point, things are about being cutting edge and challenging the design studio and seeing things from a new perspective. 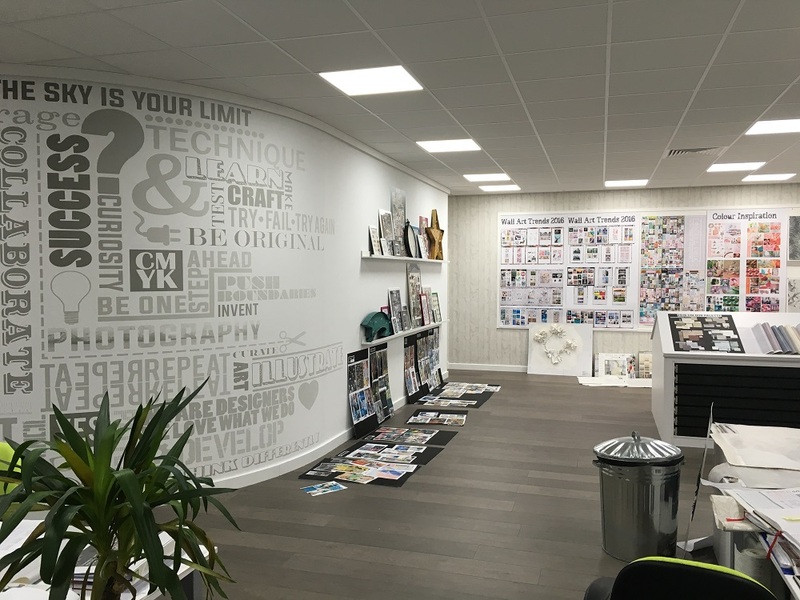 It’s ironic because trying to get a designer to work with wallpaper when I started was very difficult and at the time there was only one distinctive designer wallpaper range in the entire industry which was with Jeff Banks and now we have a full portfolio of designers that are happy to work with us. We help each other quite a lot, we collaborate well which has led to us being approached by many other brands and designers to work with – wallpaper is definitely back. But there’s no formal check list for the designers we work with. Wherever we are at a point in time, we’re determined to grow our brand significantly and sometimes those things can be a distraction. You have to consider that if you work on another project it’s whether it’s worth it from a time and resource point of view. It’s great that they’re all interested in getting in to wallpaper without a doubt but it’s down to numerous factors whether we pursue it or not. One of my favourite projects to work on, is International Wallpaper Week. I suggested this three years ago as National Wallpaper Week, and we thought it was a good idea. We had no idea about how one does it, so we just started it. 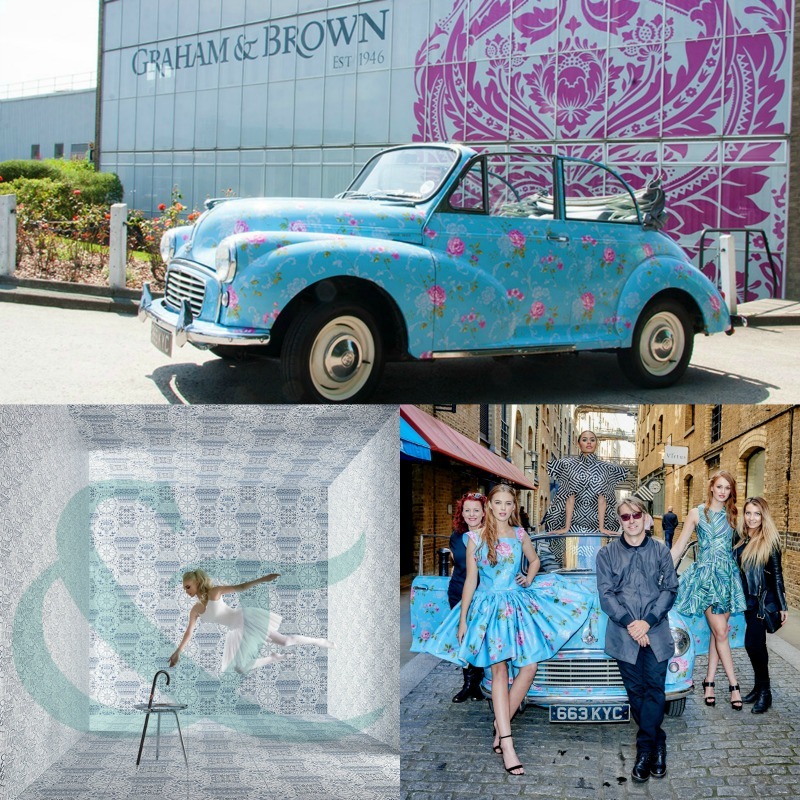 Since then its become international wallpaper week, we’ve been on BBC1, Chris Evans’ radio show, done model photoshoots in wallpaper dresses across the globe, done demos in stores, and this year we’re bringing the two things we love here at G&B – wallpaper & parties! So we’re encouraging everyone to have a wallpaper party. Get friends round to help you redecorate, get it done even quicker – then repay the compliment. It can create community! Should be a lot of fun. Where do you see G&B in the next 5 years? I think we’re at a tipping point with wallpaper and with our business as a whole. In 5 years’ time, we will have a well-respected lifestyle brand that reflects the amount of passion, energy and talent that goes in to the product. All available with a fantastic 5-star service through our website to everywhere in the world. Being recognised as a lifestyle interiors brand that you can buy the whole room from, including wallpaper, paint and accessories. Being able to say, here we’ve designed this room for you, we’ll install it for you. To be at the forefront of a leading, creative brand that will have grown in size significantly. Whilst the brand that built this business, Superfresco will continue to go from strength to strength, It’s never been easier to use, or remove, when you fancy a change – and its presence across the world continues to grow for people who want to do-it-themselves, it’s a fantastically easy product to put up and take down. Whilst I fully expect people to continue singing the TV jingle – “what goes up must come down” for a long time yet. There are a lot of challenges ahead but that’s the same with any business - it’s what makes working here so interesting and most of the time enjoyable.